THREE RIVERS, Calif. — As we marched through the Giant Forest of monumental trees prestigious enough to be named after former U.S. presidents like Abraham Lincoln and Ulysses S. Grant, Frank Helling, park ranger at Kings Canyon National Park, halted at what seemed to be an uninteresting stump. With that short description, Helling took hikers into the past, proving that these majestic sequoia trees not only carry beauty but also tremendous amounts of history. “Wait, an actual hotel? How is that even possible?” asked a hiker in awe. At left, student Megan McCrink stands in front of one of the two entrances into The Fallen Monarch (Photos by Donatella Vacca). “Well young lady, think of it in terms of the 1800s. The fact that the tree was hollow allowed for it to be perfect temporary housing for loggers, like a refuge. Then, it was turned into a gathering place,” answered Helling. Many visitors might find the standing sequoias much more appealing than those that have succumbed to the forest floor. However, this tree is more than just a big old log lying on the ground. The Monarch Tree, also known as The Fallen Monarch, has lived through different periods of history, seen many faces and survived all seasons. 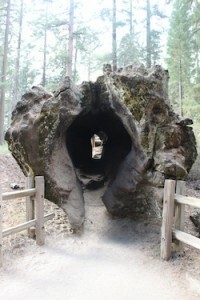 To this day, although its value is not linked to its towering height but instead its unique past, it has become part of the renowned sequoia giants and the Grant Grove tree family. Desperate to seek refuge during the harsh days of winter, it was turned into a humble shelter by local loggers known as the Gamlin brothers. The tree served as a temporary home during the construction of their cabin, which is located just a few steps from the Monarch itself. But, as the brothers moved into the new house and the tree’s commodity and identity became more popular, it was declared the local saloon and hotel with tables, chairs and even a homemade chimney rooting out of the tree’s own bark. Later, in time, this chimney was used as a cook stove and the trunk as the stables for 32 horses of the U.S. Cavalry. Burned by natural wildfires, the tree became hollow and eventually fell down creating a tunnel or a walkway right through its core. Ar right, a visitor peeks into the heart of The Fallen Monarch, which used to stand tall and strong. Both the giant roots and the top of the tree serve as the two entrances into the saloon, depending from which trail you are using. If one stands at either of these entrances, the other side is visible far away in the distance like a tunnel vision. In other words, the 124-foot Monarch Tree serves as a way of helping visitors grasp the sense of how gigantic these sequoias become. 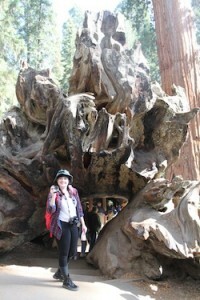 Standing in the heart of what used to be the tree’s trunk with several feet still available on top and around, visitors realize of the immensity these trees are able to reach. One thing is to stand next to a sequoia, but another is to actually step and move inside of what once used to be a colossal trunk. With an arched roof, wood smell and a wide-open side that allows for astonishing views of the forest, this tree feels like the cozy porch of a typical cabin in the woods and this is probably the main reason why at some point of its history it became a great place to gather. Walking around the guts of the tree, seeing the burned bark and the worn-out trunk and smelling the wood, plus getting to know the Monarch’s story, helps picture the past and imagine what happened here hundreds of years ago. 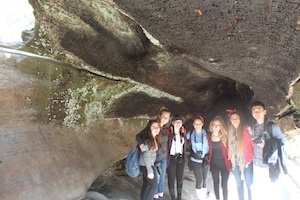 “I was incredibly shocked to learn that the hollowed-out tree log was used as a hotel,” said Melissa Ostroff, a visiting junior from the University of Miami. At left, a group of students stands inside The Fallen Monarch, admiring the greatness of its core and size. Below, The Fallen Monarch proves how majestic both standing and fallen sequoias can be. Trying to picture how this tree was discovered, how it was turned into a saloon and how the Gamlin brothers survived in it, makes fallen sequoias as interesting and unique as those still standing. “It was so cool to actually stand inside a tree that was once used as a saloon. Not only was it a massive part of nature, but it was also a part of human history,” said Lexi Williams, another junior at the University of Miami. Similar characteristics also make another famous fallen sequoia as interesting and fun as the Monarch Tree. The Tunnel Log, located on Crescent Meadow Road, also has its own history to tell. Although it towered high during its days of glory, this unnamed tree eventually fell due to natural causes in 1937 and it became the first drive-through tree in Sequoia National Park. Making good use of its enormity, 275 feet high and 21 feet wide, a Civilian Conservation Corps crew cut a wide tunnel through part of the tree, creating a unique underpass deep in the core of the forest. “It’s been down since I was a little kid. There sure is a long drive to it, but it’s definitely worth it. Besides, when is it that you get to actually drive through a gigantic fallen sequoia with your own car?” said Helling. Although he explained the experience is unique, Helling confessed there is a “papa Tunnel Log” that gave the crew workers the idea of cutting a bypass. 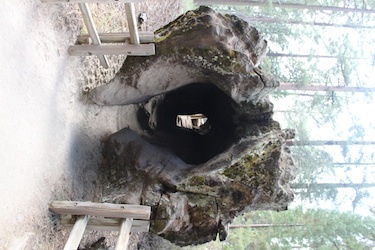 The original tunnel log known as Wawona Tunnel Tree is located in the Mariposa Grove of nearby Yosemite National Park, and it is indeed the great-grandfather of The Tunnel Log. “People could drive through this tree before it fell in 1968. It was unique because it was actually standing and alive. Ours is great and amazing, but it’s not to be confused with Wawona,” said Helling. With a deep forest backdrop and picturesque surroundings and although the tunnel was manually carved, it makes for a great experience and an exceptional photo opportunity. Besides, the drive to the tree is visually dynamic and 100 percent worth it. It is true that sky-high sequoias are astonishing by themselves, but those that have fallen down usually carry certain history and great tales behind them, making them earn an interesting identity. 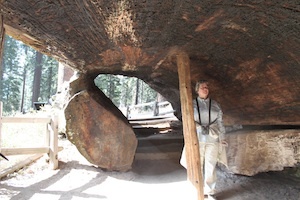 Tunnel Log and The Fallen Monarch are then just a few of the thousands of sequoia trees that voice out the souls, stories and surroundings of past generations that are hidden deep inside these national parks. Sequoia and Kings Canyon National Parks are located in the southern Sierra Nevada, east of Visalia and east of Fresno, Calif. , and are managed by the U.S. National Park Service. Campgrounds: Mostly located in oak woodlands near the warm and dry foothills, or in the higher and cooler conifer forests. These campsites are known as: Lodgepole, Dorst, Grant Grove and Atwell Mill, and they range in elevation from 2,100 to 7,500 feet. All visitors must know that a great portion of both parks is roadless wilderness, with little to no development. For further information, visit the National Park Service website http://www.nps.gov/seki/index.htm or call 559-565-3341 for more assistance.